Are you looking for a close and cuddly way to carry your baby? Have you decided to purchase a baby wrap, but don’t know where to begin? Shopping for the perfect baby wrap can be overwhelming. You’re going to spend a lot of time wearing your carrier — so you need it to be comfortable for both you and your baby. I spent a long time looking for the wrap that does it all. Along the way, I learned a lot about baby wraps and wrapping. Here’s what I found — I hope it helps you find the perfect wrap you’ve been searching for. Use the links above to check the latest prices or read our in-depth baby wrap reviews below. Which Baby Wrap Is Right for Me? 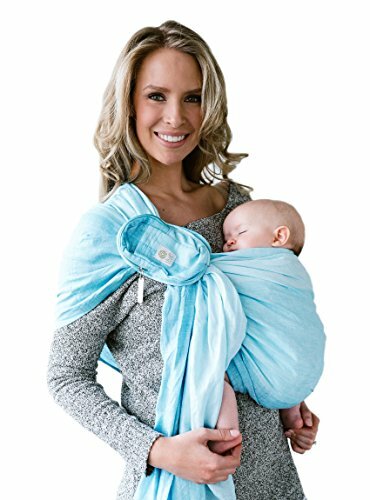 Different to a structured carrier, a baby wrap is, essentially, just a long piece of fabric with no buckles, belts, or clasps to complicate things. The fabric is wrapped around your body in different ways, to create a comfortable pouch for the baby to sit in. A lot goes into shopping for a baby wrap. If you’re in the market for one, these are some things you’ll want to check out. Whatever kind you decide is right for you, make sure its construction is good quality. Your baby is relying on you to keep them safe — shoddy workmanship and subpar materials won’t cut it. Before purchasing your wrap, double check the status of the materials used. Are they safety compliant? Are they fire-rated? Has the wrap been tested and evaluated by commercial safety organizations? Don’t be swayed by a lower price tag if it means sacrificing safety. The extra money for a wrap that’s been fully tested and approved will be money well spent. After safety, you’ll want to look at how you plan to use your carrier. Not all wraps are appropriate for all carrying positions. If you know you want to carry on your back, make sure you buy a carrier that’s rated for back carrying. I made the mistake of bringing home a carrier I couldn’t use with a newborn — and that was the whole reason I’d been looking for a wrap. Make sure you get what you want from your wrap — by knowing what you want before you make your purchase. Your carrier is going to be exposed to all the delightful things babies bring with them. This might include — at one time or another — spit up, diaper leaks, and vomit. You might find the only time you have two hands-free long enough to eat a meal is when your baby is in the wrap. If that’s the case, your wrap will also be exposed to spills and food, too. I like wraps that can be put in the washing machine, which most can. Yet some wraps need to be hand washed, or even taken to the dry cleaner. I know I can’t commit to that level of care, so I opted for something else. Know what you’re willing to do to maintain your wrap before you go shopping. Baby wraps are available in a wide variety of materials. You have non-stretchy woven materials, 4-way stretch jersey, nylon, and linen — just to name a few. Some of these are better for cooler weather (they get hot and don’t breathe well), while others are great for rigorous outdoor activity or hot summers. Keep this in mind when shopping. You might find you need multiple wraps to suit different times of the year, or different activities. If you’re hot while trying on a wrap without a baby in it, standing in the aisle of an airconditioned store — you’ll definitely be hot wearing your child. While they may seem a little fiddly to use at first, the right wrap will soon feel like a second skin to you, and you won’t want to live without it. Finding a product that fits both you and baby is a little like shopping for normal clothing; you need to take your time and pick something you know you’ll wear and love. Here’s our pick of the crop. Using a wrap with a newborn is great. You’ll free up your hands for everyday tasks, while still providing the comfort and closeness that newborns crave. Look for a soft, comfortable fabric. The Baby K’tan is a great option for a newborn, as it’s a stretchy knit, made from 100 percent cotton. It’s very comfortable for both you and the baby, but can get warm if temperatures are high. This wrap is easy to care for and can be both machine washed and dried. This is a huge perk when dealing with a newborn. Discolored spots of dubious origin, spit up, and remnants of your lunch are all a thing of the past. Unlike some other wraps, this one is simple to use — there’s no need to learn complicated wrapping techniques. The two separate pieces are easy to navigate, even for a beginner. The Baby K’tan also offers a variety of positions suitable for both nursing and newborns. I love that this can be used with a new baby but can still be used well into toddlerhood. Its simplicity means it’s a little less customizable than other wraps; if you and the other babywearers aren’t a similar size, you won’t be able to share this. The stretchy material can be problematic with older, heavier children. While easy to use, this wrap is less customizable than some others. Can be warm in hot weather. Wearing a baby during warm months can be uncomfortable. Choosing the right wrap can make all the difference — a breathable fabric can keep you both cool. If you have a baby who’s not old enough for sunscreen, look to a wrap with sun protection built in. I can’t get enough of the Moby Wrap Evolution with built-in UV protection, for just this reason. You won’t be able to do a back carry with this wrap, which tends to be cooler, but it does allow for several different carry positions. 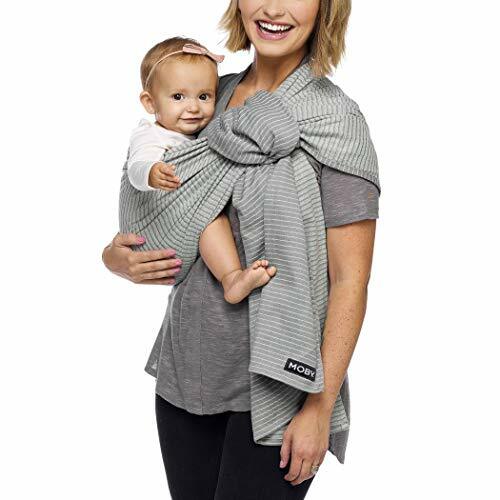 The Moby wrap is safe to use with both front and hip carries. You’ll probably need to spend some time learning how to use it, but it’s more than worth it. Practice using it around the house until you’re comfortable with the techniques and the fabric is broken in. You’ll find the lightweight material means it’s comfortable to wear, even for long stretches of time. The fabric is breathable to keep you and baby cool, and it’s softer than other wraps I’ve used. While this can work for multiple wearers of different sizes, it’s not truly plus-sized friendly. Even if you’re taller than average, you may find there’s not enough material for a safe wrap. Superior quality fabric with built-in UV protection. Suitable for both very young children and older toddlers. This is a true wrap that can be intimidating for a beginner wearer. No one knows how precious a free hand can be than a mom of multiples. Tandem wearing can be a great way to lighten your load. Commercially available wraps are not rated to be used for tandem wearing, but a long enough length of fabric will do the job just fine. If you’re looking for a wrap that’s able to handle tandem wearing, the DIDYMOS is a great option. It’s what I would choose if I were bringing home a set of twins. This is probably one of the only products you can buy just one of. It comes in a range of sizes, with a size 7 or 8 the most frequently recommended for multiples. It’ll give you the extra length you need to wrap both babies safely. The DIDYMOS is made entirely of cotton and is fully adjustable. It’s safe and easy to use for newborns all the way through preschool-aged children. This is a product that will grow with you, your children, and your babywearing needs. I love the beautiful colorways this wrap comes in, and it’s great for couples who vary significantly in size. The extra fabric in the larger sizes makes it suitable for wrapping twins easily, and accommodates a larger wearer. You are definitely going to want to spend some time learning how to use this wrap, though. Practice getting the techniques down without the babies first. Once you’ve mastered (more or less) the art of the tie, experiment with what it’s like to get the babies in and out of it. Multiple babies bring with them additional challenges, but you’ll love the results you get with the DIDYMOS. Extra long to serve tandem wrapping needs or larger wearers. Can be used with a single child as well. Material is comfortable even during hot weather. The lack of safety testing and acceptance of tandem wearing can make finding important information difficult. You’ll need practice and patience to learn how to safely tandem wrap. Fabric may be stiff at first, and needs to be broken in. If you find some wraps just won’t work for you because the length isn’t sufficient, a stretchy wrap can be the answer. These are great if, post-pregnancy, you’re moving between sizes and having shape fluctuation due to nursing. My favorite size-friendly wrap is the one from Boba. It’s one of the original stretchy wraps, and there’s a reason it’s still around and doing well. I can’t say enough good things about having a wrap that’s machine washable and dryable. When my Boba encounters an unfortunate baby-related mishap, it’s as good as new in two short hours. This wrap is also great for nursing. The spandex in the fabric helps it keep its shape — and it stays where you want it to be. The fabric molds to your body, whatever size you are, and however your shape changes. You’ll also find this wrap easy to use. You can be suited up and out the door in a matter of moments. When you’re juggling your baby, a diaper bag, and your own belongings, you know just how much that can mean. Great for all shapes and sizes. There’s a lot of material in this wrap — you may find there’s just too much of it if you’re on the shorter side. The fabric can be hot and heavy. I’ve known quite a few dads who aren’t opposed to wearing their babies. But, when you whip out your trusty, endless, piece of fabric they suddenly start backing away — and not slowly. Look for wrap that’s man-friendly, in both structure and design. 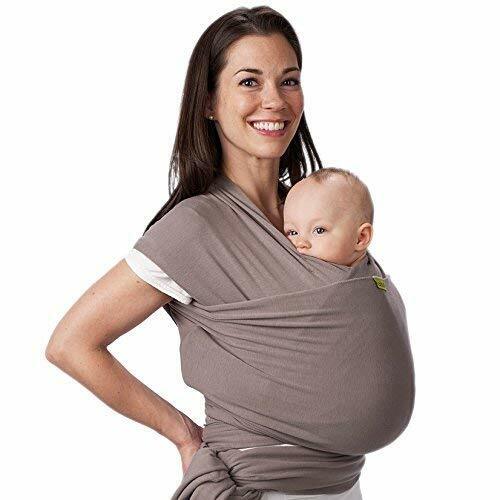 I love that the Moby Sling Wrap is simple to use — it’s not intimidating for a new dad, or mom, who’s just trying to get the hang of babywearing. There are no complicated maneuvers or methods to learn. Just put the wrap and baby on, and go. This is for use with newborns to toddlers, and offers both hip and front carry options. It’s one size fits all, so there’s no need to worry about sizing. If you’re inclined to share a wrap, this model is the way to go. The fabric is breathable, woven cotton that’s machine washable and comfortable to use, even during long periods of wear. 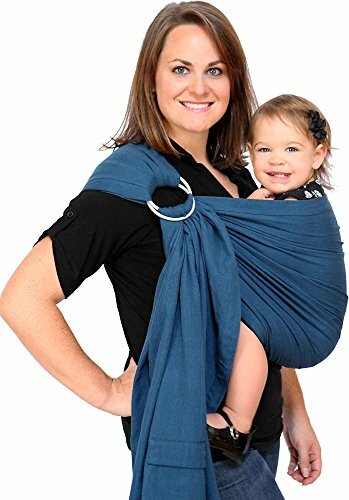 If you have a partner that’s looking for a functional and intuitive way to babywear, the Moby sling wrap is a great option. Neutral design that dads won’t mind wearing. Straightforward and easy to use. Easy to care for and maintain. A great option for couples who share babywearing duty. Can be used with heavier babies — it’s rated for use all the way up to 45 pounds. Fabric is thick and can be difficult to adjust. Can be too warm and heavy to wear. Wearing your baby by the water can be an intimidating thing. Even more so if you plan to actually go into the water. You need to know your child will be safe. When shopping for something you can wear water-side, look for a wrap that’s quick drying and lightweight. If you can find one with UV protection, that’s even better. 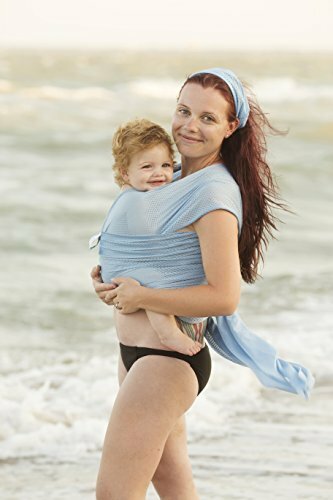 The Beachfront baby wrap has everything you’re looking for in a swimming wrap. The material is light and it dries quickly. It’s also comfortable and made in the United States. But best of all? It’s safety tested, and CPSIA and ASTM compliant. I love the UV protection the wrap affords my child, especially when swimming. I don’t need to worry about repeatedly pulling out the sunscreen. It’s also nice to know there’s one more barrier between the sun and sensitive skin — just in case I’ve missed a spot. Of course, this wrap isn’t only for use by the water. It’s great to use anywhere — all year round. A great feature is that there’s enough stretch to feel like this is customized to your shape. The stretch is only in one direction, though, so you don’t need to worry about any extra stretching or sagging. You can use this for hip or front carries, and it’s ideal for young children and breastfeeding. While you can use it out of water, you may find it slips out of place easily when dry. Fully tested and safety compliant. Constructed with non-toxic materials and made by work-at-home moms in the United States. The fabric is slippery when not wet and can be difficult to tie. Not as customizable as some other wraps when it comes to fit. Wearing a baby on your back is a great option if you have multiple children to wear. You’ll also find it’s more comfortable to carry heavier babies for longer periods of time on your back. Make sure the wrap is strong, durable, and supports heavier weights. This design is made from 100 percent organic cotton. It’s sturdy and durable and can support a heavier child, which you really want when looking for a back carrying wrap. You’ll use back carrying techniques mostly with an older child, especially if you’re tandem carrying a younger baby on your front. My toddlers loved to peer over my shoulder in this position, and see the world from mom’s perspective. The Dolcino is available in two lengths, so you can have more or less fabric, according to your needs. It’s also easy to care for and can be machine washed, making it a great option for people who are new to babywearing. I love that this wrap is great for back carrying, but also for other types of wearing. The material is soft and thin, and just as suitable for front carrying a young baby. The Dolcino wrap is available in a variety of beautiful colors, all dyed to IANT standards. If you’re looking for a fashionable babywearing accessory that will be in it for the long haul — this might be the perfect choice for you. Great for wearing babies in multiple positions, from babydom to toddlerhood. Suitable for even hot weather wearing. If you plan on using this wrap for multiple types of carries you may need to invest in both sizes. The color of the dye job is not consistent from wrap to wrap. If you breastfeed, you know that you’re going to be dedicating some serious time to the activity. Having a wrap you can nurse in will make feeding sessions that much easier. Choose something with enough material to put baby in the right position for nursing, and to cover if you want to. This wrap is a great option for someone looking for the benefits of a wrap with a little extra comfort and cushioning. It’s great for a newborn because they spend so much time in your arms. If you can free up your hands for some of that time and still be comfortable, you’ll be happier for it. The Maya wrap has some light padding through the shoulder area, which distributes the weight of your baby evenly across your back. This helps you avoid the painful digging of straps into the shoulder area when wearing for prolonged periods. It’s also available in multiple sizes for a custom fit. Breathable, handwoven cotton is the perfect choice for a growing baby. They won’t become overheated — and neither will you. You should always be aware of where your baby’s mouth and nose are while you’re wearing them. Breathable, natural, fabrics like the cotton used in the Maya can help ease your mind when baby is in a more covered nursing position. Discreet nursing is definitely doable in this. It’s easy to position the baby without being exposed, and you can also use the tail end for additional coverage if you prefer. I love that this shields what’s going on around you from the baby. If you’ve ever nursed an older baby, you know they can become easily distracted. 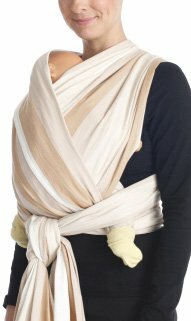 The Maya wrap creates a great little cocoon, where your baby can eat a full meal without distractions. Supplied with an instructional DVD. Comfortable to wear for long periods of time. Wrapping with toddlers comes with its own challenges. Toddlers are both more active and heavier than their younger counterparts. You need a sturdy wrap that will provide the support you need, while keeping you comfortable. Woven wraps are the best choice for an older (or heavier) child. The same stretch that’s great for a baby wrap with a young child can allow for too much give once your baby weighs more. This can put pressure on your lower and upper back, instead of providing stability and comfort. The Hip baby wrap is made entirely of cotton, and offers front, hip, and back carrying options. Each one is handmade and individually dyed, but it’s still machine washable and easy to care for. A fair-trade product, you can feel good, not only about the benefits of using it, but also about the way it was made. I love that this wrap can easily accommodate breastfeeding needs. It would be nice to see some extra length in the wrap, though. As it is, it won’t be the best option for a mom who’s plus sized. Learning how to use wrapping techniques can be time-consuming. The Hip baby wrap is something you’ll need to invest some time into learning to get the most out of it. Once you’ve mastered the movements, you’ll think it’s entirely worth it — and probably forget how frustrating it was in the beginning. This wrap can be hot. Complicated for the inexperienced wrapper. Sleep is crucial — for both you and your little bundle. A soft, breathable wrap that allows for comfortable sleep is worth its weight in gold. Made from linen, the LILLEbaby ring sling is lightweight and breathable — it’s perfect for naps. You won’t need to worry about your little one overheating. The extra breathable fabric will put your mind at ease and keep your baby breathing easy. This is also a wrap that’s easy to learn to use. You won’t be overwhelmed trying to understand the ins and outs of positioning. It’s straightforward — you’ll love it, and so will your baby. It’s super easy to travel with for naps on the go, and it takes up barely any room in a diaper bag, purse, or stroller. When wearing, a handy pocket can keep everything you need at your fingertips — pacifiers, phones, money — so you won’t need to fumble around while trying to balance your baby. This is great for a lightweight baby, but there isn’t a good way to redistribute weight. If your child is older or heavier, you may find this isn’t comfortable to use for long stretches. Lightweight and comfortable fabric, even in hot weather. Can be uncomfortable with a heavier child. The fabric can be stiff and doesn’t always lie as it should. The right baby wrap for you is going to depend on who’s doing the wearing — and how you plan to wear your baby. Take into consideration the size of the wearer. If there’s a great size variation between the main wearers, you might need more than one wrap. Some offer limited positions for your baby. You may find the position you think you’ll use the most doesn’t work for your baby. Every child is an individual — some might love a hug hold, while others will be frustrated if they can’t look out. What Carrying Positions Are There? This is a cradled position where the baby’s body makes a c-shape. The head is up near your shoulder, the feet by your opposite elbow. This is a great position for nursing, and the baby’s head is positioned well for hearing your heartbeat. They’ll be secure and comforted against you and you’ll be able to get a little more done — even if it’s just reading a chapter of your favorite book or sipping some well-deserved tea — don’t you wish? This is a versatile position, suitable from the time a baby has a little more control over their head, through 1.5 years. The baby is facing you, head at collarbone level. They’ll be able to move their hands up toward your shoulders or around your back under your arms. The legs will be on either side of your body. This carrying position is closely mimicked by a regular hip hold. It can be a good way to introduce your child to being worn. Like the newborn position, the baby can hear your heart and smell you. Both of these sensations will offer a feeling of comfort and security for your baby. This is another position that can be easily modified to accommodate a nursing baby. This position has the baby propped on your hip and supported by the wrap. It’s a great option for a baby that wants to interact with others while still having ready access to you. For you, the hip sitting position will give you a little more freedom to use the side of your body not supporting your baby. This is a good position for a confident sitter, and is recommended for babies aged six months and up. As your baby gets older and has more interest in what’s going on away from you, you’ll find more value in the facing out positions. The forward facing out position is the opposite of the hug hold. Instead of facing you, the baby will be looking in the same direction as you are, sitting slightly lower than when in the hug hold. They’re still able to feel your heartbeat and your heat, while engaging with the world around them. Another facing out position you’ll find suitable for a confident sitter, is a modified cradle. Like the newborn position, the baby is against the front of your body, and you are providing significantly more stability for the baby than in the hip sitting position. In this position, the baby is upright and looking out. It’s not a great position for sleeping, but it’s perfect for interactive babywearing. When wrapping for back wearing, your baby will generally face forward. They will hug your back and look in the same direction you’re looking, just like when you’re using a front carry facing out position. You can choose from a rucksack wrap, a back cross carry, and numerous others. Many of these options are beginner friendly, so it just comes down to what’s comfortable for you and your baby. If you’re looking for more information on wrapping techniques, Wrap Your Baby is a great resource. Can My Baby Sleep in a Wrap? Babies can absolutely sleep in a baby wrap — they’re biologically programmed to sleep while being held. Your little one is warm and content, listening to your breath, your heartbeat, and the sound of your voice when you speak. It’s the perfect time to nap. Your breathing and heartbeat will help regulate theirs, which can help prevent SIDS (source). Just make sure you have baby in a safe position, with the face fully exposed. Can I Carry Twins in a Baby Wrap? The short answer to this question is “yes!” After all, people have been wearing multiple babies for centuries. The long answer is a little more complicated. To be commercially available in the United States, baby wraps and carriers undergo extensive testing. Testing for multiples is not possible, so many companies will no longer officially recommend their product for such use. 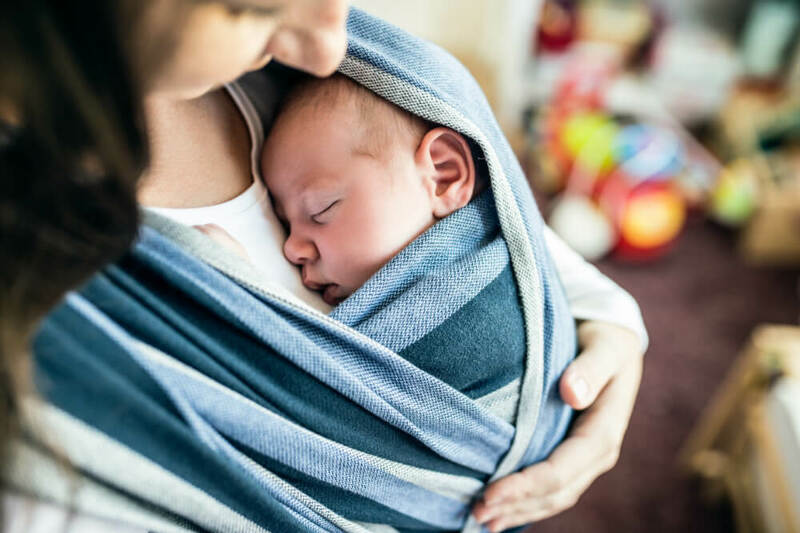 Always discuss babywearing with your pediatrician first — especially if your children were premature, had low birth weights, or have compromised respiratory systems. These factors are frequently found in children of multiple births, and babies with such issues are at risk for accidental death during wearing (source). If you’re interested in using a wrap with your twins, I highly suggest researching the ins and outs of the products you’re considering. Look to other parents of twins and pediatricians for the best advice on wrapping — there are so many different ways to carry two! Can I Wear a Baby Wrap if I’m Pregnant? You can, of course, wear a baby while pregnant — as long as your medical team gives you the go-ahead. If you’re on restrictions of any kind, it’s probably in everyone’s best interest for you to pass on babywearing. After your new baby arrives, you can experiment with tandem wearing. Always listen to your body — if something hurts or doesn’t feel right, stop and consult with your doctor. Try a hip or back carry, to avoid any pressure and discomfort. A stretchy wrap can provide additional support for a belly with sore round ligaments. Can I Wear a Baby Wrap if I’m Plus-Sized? You can definitely use a baby wrap if you’re a plus size. A wrap can be a great way to get the custom fit you need, as they come in a variety of lengths and sizes. Make a trip to a brick and mortar store to have a fitting done, and try out your options. How Do I Breastfeed While Wearing a Wrap? Breastfeeding while wearing a baby wrap is entirely possible. It can even be a great way to discreetly nurse in public. It’s all going to come down to the position you have your baby in — and what clothing you’re wearing. Nursing bras and shirts with nursing panels will be the easiest to navigate while wearing a wrap. 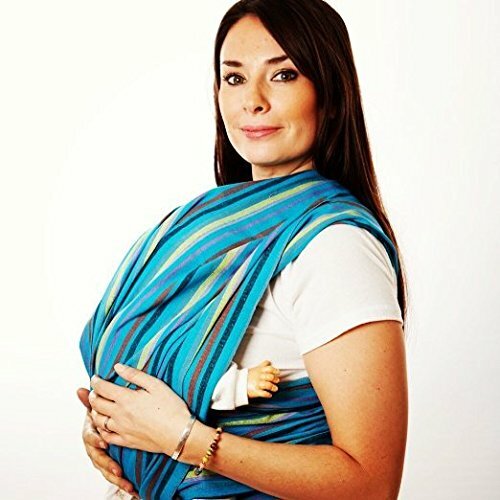 Both cradle and upright positions can be used successfully for nursing while babywearing. 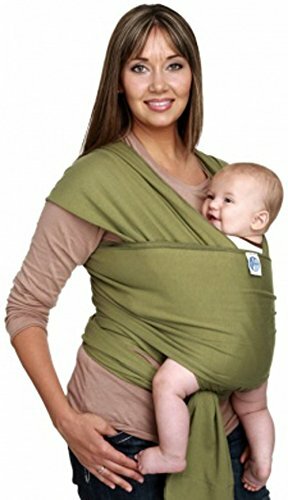 Can I Wear a Baby Wrap on my Back? Yes, you can use a baby wrap to wear your child on your back. It’s ideal for older babies, as they’re still being held in a healthy position and can see more of the world from this view. However, not all wraps allow for back carrying, so check this before you buy. Can I Use a Baby Wrap on an Airplane? A wrap is a great option for traveling. Using one gives you the freedom to use your hands for other things while walking through the airport and boarding. It’ll also help alleviate some of the discomfort that comes with holding your baby for long periods of time. According to regulations, your baby may not be worn during takeoff and landing, though. Be prepared to get situated with your baby and the carrier after you are in the air and only until the descent. Can I Use a Baby Wrap with a Preemie? While you may need to take extra care with a medically fragile preemie, babywearing can have exceptional benefits for a tiny baby (source). Chest to chest contact with your new baby has been the subject of many studies. Kangaroo care — as it’s frequently called — has become a viable component of treatment plans for premature and fragile babies (source). Using the wrap safely with your preemie and making sure the breathing space and airways aren’t compromised is paramount. Working under the guidance of your medical team is the best way to get started. 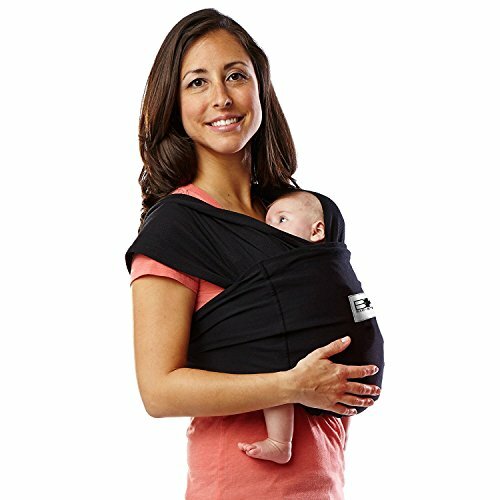 What Is the Best Fabric for a Baby Wrap? There isn’t necessarily a “best fabric” for a wrap. Much of this will come down to how and when you plan to use it, and your personal preference. I know people who love their woven wraps for the sturdiness and sense of security that comes with their use. On the other hand, I can’t get enough of my very comfortable, very stretchy, jersey wrap. Don’t lock yourself into one or the other without giving them both an equal chance. Try them out with your baby, and in the positions you’re planning on using. Know that the first baby you have might vary wildly from any subsequent baby that comes along. Babies have their preferences, and what worked for one might not work for the next. Can I Use a Baby Wrap if I Had a Cesarean Section? Whether you’ve had a baby vaginally or via C-section, you shouldn’t plan on wearing your baby out of bed immediately. Birth is strenuous and can be draining. Once you’ve made your initial steps, taken a trip to the bathroom, and had your first shower, you can discuss babywearing with your doctor. Post Cesarean, you may have additional restrictions, like lifting your arms over your head, or weight restrictions for lifting and holding. If any of these restrictions impact your ability to put on the wrap, or put the baby in the carrier, you should wait until you’ve been cleared to do so by your doctor. By the time you’re ready to be up and about and holding your baby, chances are you’ll be ready to use your baby wrap as well. It’s easy to see that every one of these wraps could be worth adding to your collection. If you’re watching your budget or have space restrictions, though, you might not be in the position to bring home one of each. If I had to choose only one of these, I’d go for one that’s versatile. I would want something that could take me from infanthood all the way into childhood, and suit a variety of carries. With that in mind, I’d reach for the DIDYMOS Woven Wrap. I love that I can order it with extra length to suit fancy finishes and complicated wrapping techniques — if I ever get around to learning how to do them! If not, I know I’ll be able to wrap it an extra time or two to use up the excess fabric. If you haven’t looked into local babywearing groups, I highly recommend them. If you have any additional questions or need demonstrations, they can be an invaluable resource. I’d love to hear your experience. What have been your go-to purchases? What techniques do you use most and what can’t you wait to try? Leave a comment below — I’m sure there are things I need to add to my own list! What are the Best Baby Carriers? Carriers vs. Slings vs. Wraps – Which is the Best?